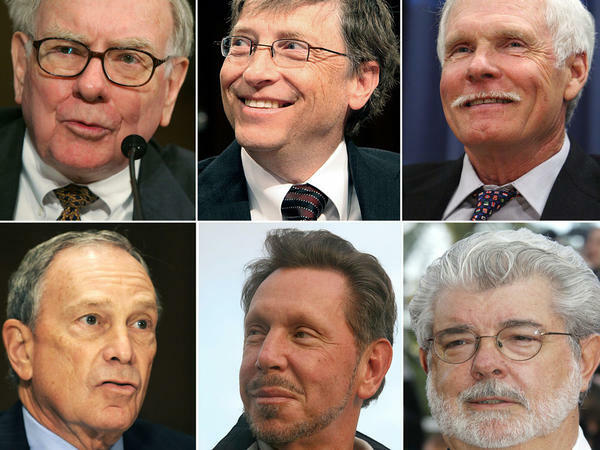 Those making the pledge to give away most of their money include, clockwise from upper left, investment guru Warren Buffett, Microsoft mogul Bill Gates, CNN founder Ted Turner, Hollywood director George Lucas, Oracle co-founder Larry Ellison and New York Mayor Michael Bloomberg. Forty U.S. billionaires pledged Wednesday to give at least half of their wealth to charity -- either during their lifetimes or after death. 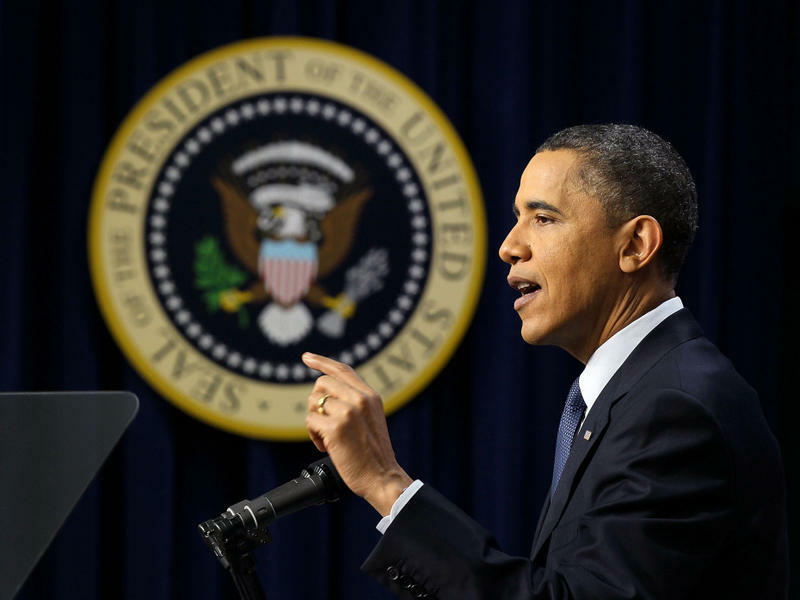 That could be a big boost to nonprofits, which have suffered from the recent economic downturn. The list of those taking the pledge includes some of the nation's wealthiest individuals: Bill and Melinda Gates, Warren Buffett, T. Boone Pickens, Michael Bloomberg and George Lucas of Star Wars fame. It also includes some not-so-well-known billionaires, such as California hedge fund founder Tom Steyer and his wife Kat Taylor. Buffett says the purpose of the public pledge isn't just to increase how much these people give -- many had already planned to give a lot -- but to inspire others to give as well. "So it will be more philanthropy, and smarter philanthropy in the future is the goal," he says. The pledge idea came about in a series of private meetings that Gates, Buffett and other philanthropists had over the past year on the future of charitable giving. Bloomberg, like several others on the list, said he made the pledge because he has more money than he could ever use himself. "And if you really care about your family, I've always thought that the best thing to do is to make the world better for your kids and your grandkids rather than just give them some money," he says. Bloomberg says his giving, as it has in the past, will support public health, the arts, education and the environment. Steyer and Taylor say they're interested in renewable energy and sustainable agriculture. It's up to each billionaire to decide what causes they want to support, and when. It could be decades before some of the actual donations -- which involve hundreds of billions of dollars -- are made. That has some people concerned. "Everybody's focused on all that money, but nobody's talked about the quality of giving," says Pablo Eisenberg, with the public policy institute at Georgetown University. "Who will it go to? Will it go to those who are in most need in our society?" Eisenberg says the very rich tend to donate to wealthier institutions, such as universities, hospitals and the arts, rather than to smaller non-profits that help the poor and disadvantaged. Tom Tierney, head of The Bridgespan Group, which advises non-profits, says it will be some time before the impact of these pledges on specific charities is known. "But there's no question that 40 wealthy, prominent individuals and families stepping forward in this way is an extraordinary event," he says. "And it begins to force people to wrestle with the question: 'Well, should I do that?'" And if the answer is yes -- and they do start giving more -- that will mean a lot, he says. Forty U.S. billionaires made a big announcement today. They pledged to give at least half of their wealth to charity, either during their lifetimes or after death. And that could give a big boost to nonprofits, which have suffered from the recent economic downturn, as NPR's Pam Fessler reports. PAM FESSLER: Buffett says the purpose of the public pledge isn't just to increase how much these people give - many had already planned to give a lot - but to inspire others to give as well. WARREN BUFFETT: So it'll be more philanthropy and smarter philanthropy in the future is the goal. FESSLER: The pledge idea came about in a series of private meetings that Gates, Buffett and other philanthropists had over the past year on the future of charitable giving. Bloomberg, like several on the list, said he made the pledge because he has more money than he could ever use. MICHAEL BLOOMBERG: And if you really care about your family, I've always thought that the best thing to do is to make the world better for your kids and your grandkids rather than just give them some money. FESSLER: It's up to each billionaire to decide what causes they want to support and when. It could be decades before some of the actual donations, which involve hundreds of billions of dollars, are made. That has some people concerned. PABLO EISENBERG: Everybody's focused on all that money, but no one's talked about the quality of giving. FESSLER: Pablo Eisenberg is with the Public Policy Institute at Georgetown University. EISENBERG: Who will it go to? Will it go to those who are in most need in our society? FESSLER: Tom Tierney, head of The Bridgespan Group, which advises nonprofits, says it will be some time before the impact of these pledges on specific charities is known. TOM TIERNEY: But there is no question that 40 wealthy, prominent individuals and families stepping forward in this way is an extraordinary event, and it begins to force people to wrestle with the question: Well, should I do that? FESSLER: Pam Fessler, NPR News, Washington. Transcript provided by NPR, Copyright NPR. 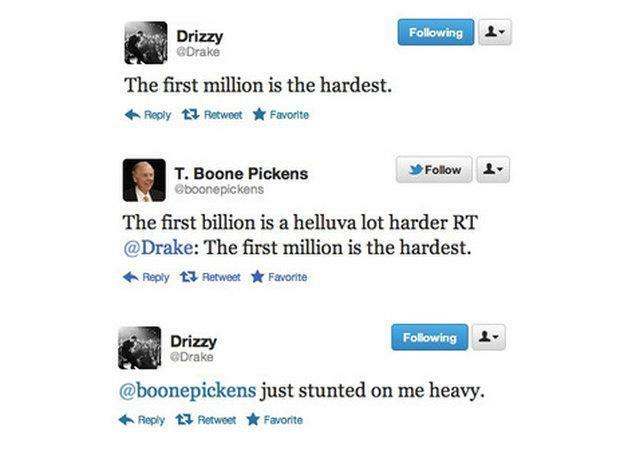 Canadian rapper Drake boastfully tweeted "The first million is the hardest". This was followed by a tweet from T. Boone Pickens, who issues a mic-drop in the form of a tweet with, "The first billion is a helluva lot harder".